Discussion in 'Announcements' started by Wazez, Oct 27, 2018. The Magnet enchant will not break custom chests & works on glass. The player death cooldown has been removed for executioners that are spawned for the event. This means if you die to a boss mob during an event, you can go back in to try again! This feature will allow you to manage what blocks can be broken by faction members in your claims. Blocks in the blocklist will work alongside the build /f perm. This is the cooldown period in which you are allowed to capture castle again. Insiding is still strictly forbidden, however due to some recent events on the server some clarification is needed. If you just left your faction and still have access to it by means of a home, teleport or /back you cannot use any of those means to raid the faction simply because you left. 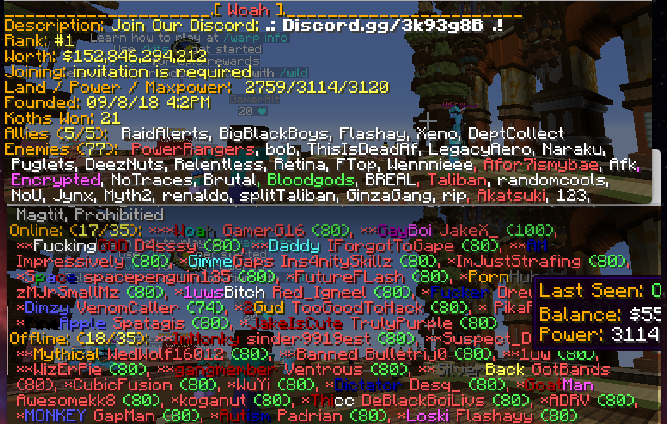 Leaders who want to quit the game or decide they don't want to play anymore cannot mine spawners and or strip perms away on purpose to get the faction raided, this is not allowed. You must give the faction away if you have any malicious intent towards your own faction. Punishments for insides are also changing, depending on the severity of the inside and the time of the inside (Example: Near the end of the map) longer bans may be given out. Factions who also collude or are associated with an inside may also get punished depending on the proof. We recently made a poll asking if you guys wanted the buffer limit increased or not. The poll results showed a 50/50 split. As of a result, we will not be changing the buffer limit of 20 chunks. Many players don't know this, but you can have bases up to 5x5 chunks. We've noticed many bases are much smaller due to people thinking that there is a smaller size limit. The F-TOP Prizes will be paid out weekly this season! Last map's winners have been awarded. Lol pretty much no gameplay changes, but still delayed by a day. Weekly ftop is a nice addition, as is not being able to mine spawners, although the way it is described as 'the server will know' is a little disconcerting. Hopefully everything works and hyped to run another map! Was hoping to see all the suggestions that were accepted to be on this but it seems it's been debuffed or made the changes from last map feel slightly less impossible to work with. Anyways, I'm glad they added weekly payouts. Explain!?!?!?!? if anything all bases are much larger then 5x5s??? Ow and 1 more thing please do raid events during the duration of the map. Just want to Let the team behind our Server resets know how grateful i am at the time and effort you put into all you do. "All the time" this reset took 10 mins out of there time. Gives credit when none of the players got anything they wanted in this changelog? Thanks, that reduces the disadvantage of people without tons of alts. does this mean items like raw beef, rotten flesh, and bottle o' enchant can be sold? No more item filtering or processing needed? 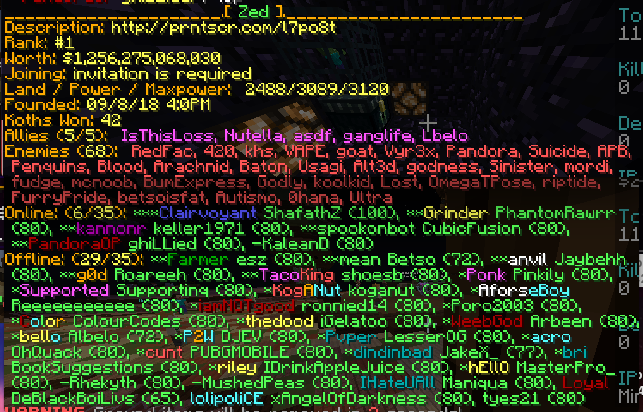 Can I now just fart all spawners into a single farm, pipe all outputs to a single sell-chest, and all is fine? Finally, spawn becomes less of a minefield. actually there is a rule preventing you from doing this if you are being raided. yall mind fixing lms death glitch? Everyone is quick to complain about the developers not getting things done right or fast enough so i though maybe instead of them hearing that it would be nice to say something nice. Im sorry if you feel my comment was not to your liking but i am entitled to thank people i feel deserve it. there is also the fact that it prob didn't take 10min buck they hd to re-activate everything that CullanP changed during the purge. Even if it appears that they haven’t done much, they have. There will always be room for improvement in the same way that there will always be things the playerbase bashes the developers for. However if there were accepted suggestions for factions that aren’t yet implemented they probably should be otherwise that defeats the purpose. "Things done" For starters they haven't got things done in like 8 maps. The only thing they've added is castle which they got from origin so I think you should familiarise yourself with that stuff before. Why would we be nice for a re release of last map with practically nothing new. Not even going to bother to respond as I'm already losing brain cells as to what you're saying.